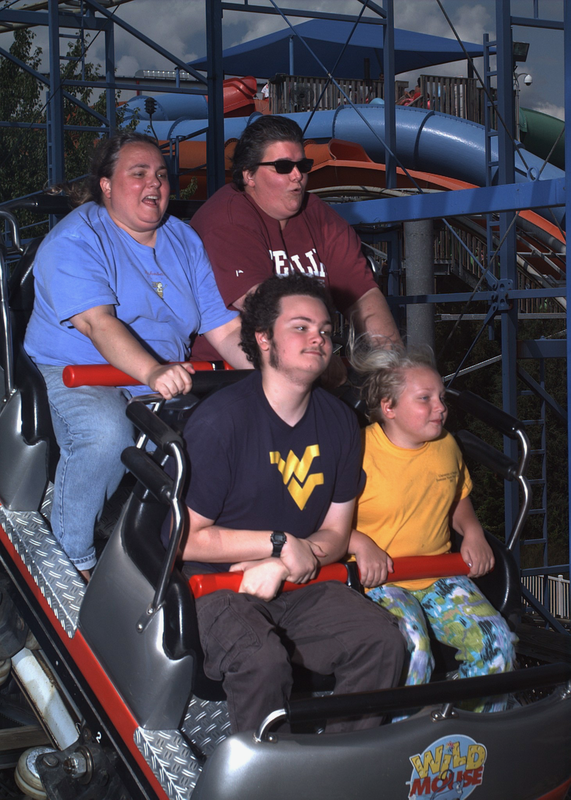 Three out of the past four summers we’ve gone to Hershey Park at the end of August. And, no, I will not write it Hersheypark, I just won’t, and you can’t make me. This year our trip wasn’t quite at the end of the kids’ summer break because our school calendar changed and they won’t go back until after Labor Day, but was close enough. We didn’t want to go too near Labor Day weekend, for fear of crowds. That’s also why we went during the week instead of on a weekend. The kids had dentist appointments on Thursday morning, so we left early that afternoon. We’ve been squeezing in as many medical appointments as we can before school starts—two pediatrician appointments, two dentist appointments, one orthodontist appointment, and Noah got his wisdom teeth out, all in two weeks. I got in on the fun, too. I contracted a raging case of poison ivy on my right arm and left hand while weeding in the yard and had to go see my doctor to get a prescription for steroids after aloe, apple cider vinegar and some OTC remedies failed me. 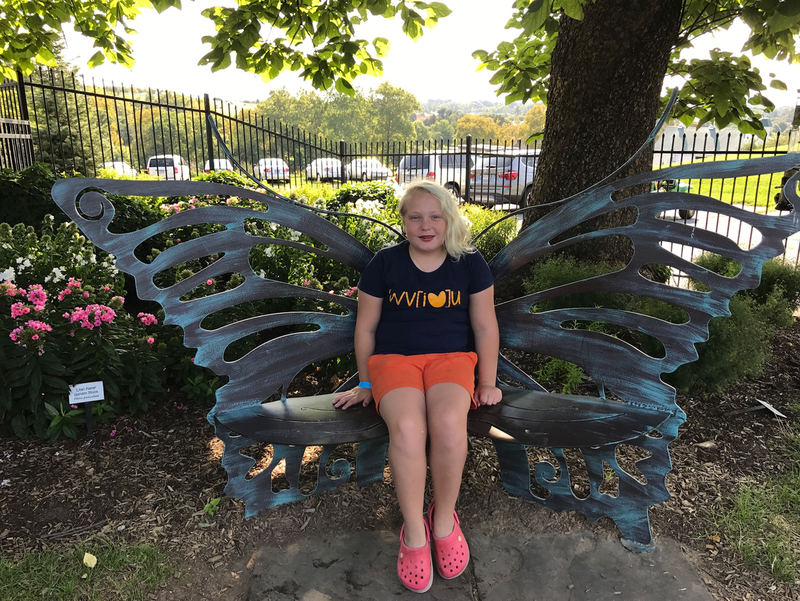 Between all the appointments and needing to work, most of my tentative plans to do some fun things with the kids during the last three weeks of summer break when their camps were all over went by the wayside. But this should make up for it. We hit the road, drove an hour and fifteen minutes and had a picnic lunch at Cunningham Falls State Park at a pretty spot near the dammed lake. After we ate we went down to the water and watched the sunfish swimming in the shallows. June, hoping to get nibbled, waded in and stood still, but the fish did not oblige. Our next stop was Gettysburg. One of Noah’s summer homework assignments is to write a short paper about monumental architecture and he didn’t want to use any of the many examples in our back yard, because he thought that’s what a lot of his classmates would do. 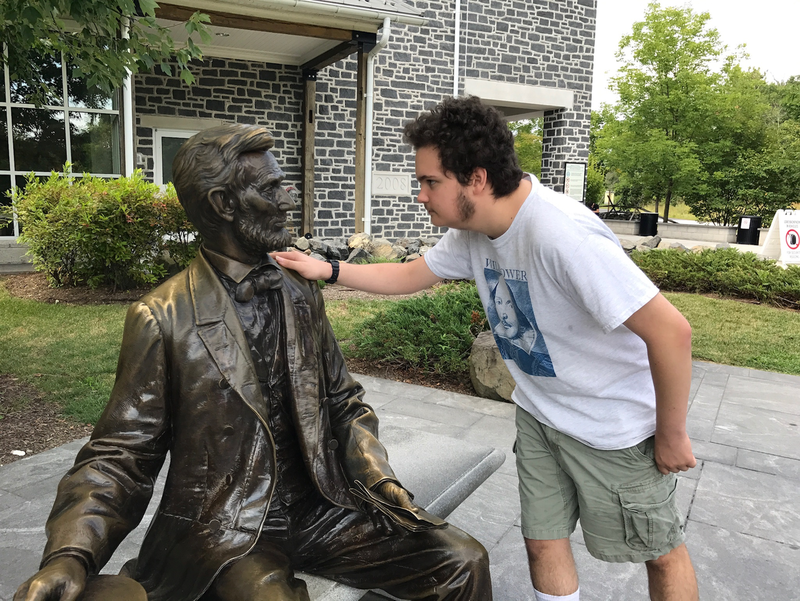 He asked me if there were any monuments on the way to Hershey Park and I suggested Gettysburg. There are dozens of monuments there. He chose the Pennsylvania State Monument, which is an excellent example of this kind of thing, having columns, a dome, the names of thousands of Civil War soldiers on metal plates, statues of many historical figures, plus Nike the goddess of Peace and Victory. It doesn’t get much more monumental than a goddess with a sword and an olive branch standing on a dome. We spent most of our time at Gettysburg at this monument so Noah could photograph it and June and I could climb to the top. (There’s a staircase inside.) There was a nice view of the battlefield from up there and you also get to see the back of Lincoln’s head from a tiny window part way up the stairs. We looked at the lists of soldiers who served and learned that of the 34,000 Pennsylvanian soldiers who fought at Gettysburg, 1,200 were killed or mortally wounded and almost 4,000 more were wounded or went missing. We also visited the Virginia State Monument and the statue of Abraham Lincoln outside the visitor’s center, where we read the Gettysburg Address on a big metal plaque. We could have read it many times, as it’s all over Gettysburg and not just in the park. I saw a motel that had the text of the address written all along the balcony rail. I was quite taken with that. The Visitor’s Center is also not without whimsy. The coffee shop is called Battlegrounds. I was a little surprised by that and thought they might as well have called it Hallowed Grounds, if they wanted to go there. But a battlefield is a solemn place and while of course I did think about divisions in our country now and then while there, what hit me the hardest was watching my sixteen-year-old son walk along one of the trails and thinking about the fact that a lot of the soldiers—twenty percent by some estimates—were boys under eighteen. I also thought about the fact that while the last seven months have certainly felt like an ever-deepening crisis, it’s far from the worst crisis our country has seen. I think we’ll survive it. And speaking of the present moment…as Confederate monuments are much in the news these days, Beth posted this essay to Facebook the day we were there. It’s a reflection by an African-American resident of Gettysburg about the Confederate monuments there. It’s worth a read. We arrived at our hotel in the late afternoon, settled in, and headed to Chocolate World. Chocolate World is a separate attraction, adjacent to Hershey Park, featuring a huge store, a food court, a simulated chocolate factory tour and other activities such as chocolate tastings. We ate dinner there and entered the park. June wanted to be measured for her ride classification immediately and was disappointed to be a Hershey bar, having missed the Twizzler cutoff by a fraction of an inch. I don’t think there was ever a time June wanted to ride a Twizzler-and-Jolly-Rancher-only ride, but it was the principle of having the options limited like that. That evening we rode the mine ride and the swings, which were all lit up with red lightbulbs. Beth, June, and I had had a late night Wednesday because June had insomnia so I was exhausted and we only stayed until 8:30. Friday morning Beth and June went to swim in the hotel pool while Noah and I stayed in the room, reading The Waste Lands. We’re up to the third book in the Dark Tower series and I’m really enjoying sharing it with him, as I love these books. Mostly I’m impatient for the kids to go back to school, so I can have some peace and quiet to work, but the fact that it will slow our progress through Roland’s world is one drawback. Being in such a chocolate-centric place had put me in the mood for mocha so Beth found a coffeehouse and I got one, plus a hot chocolate for June and at 10:07 we were walking through the gates of the park. We’d stay for almost eleven hours. (When we left, Noah said, “Why are we all so tired?”). We were tired because we walked between 18,000 and 22,000 steps according to Beth’s and Noah’s phones. We went on all manner of rides, together and in different combinations. The picture is of us on the Wild Mouse, a little roller coaster with lots of sharp turns but no big drops. The picture is like every amusement park ride picture we’ve ever purchased, with all of us looking excited or scared except Noah who is unperturbed. We also rode the smaller flume ride, which is a favorite of June’s, and the sky tram, which I love because it winds between the tracks of big coasters I’d never ride, and gives me a vicarious view of them. One of these is the Great Bear, which Noah always rides alone because no one else in the family wants to do quite that many loops. Noah, June, and I rode the sooper dooper looper, though and I even bought a tie-dyed t-shirt that says, “I survived the sooper dooper looper.” It’s one of only two coasters I’ve ever ridden that goes upside down (the other is the Corkscrew at Cedar Point) so while Noah thinks the slogan on the shirt is a joke given the small size of the coaster, for me it’s only partly one. While Noah was off riding the Great Bear a second time, Beth, June, and I went to the water park. We didn’t stay too long there so we didn’t get to do the lazy river, which Beth and I would have liked or any of the water slides, which June and I would have liked. Instead we went in the wave pool for a couple of its cycles. It was refreshing the first time but by the second cycle I was starting to feel claustrophobic, because it was quite crowded. Over the course of the day, I was dithering about whether to go on the Comet, the smallest of the three wooden coasters at Hershey Park. I’ve always loved wooden coasters best but as I get older, I get more scared of them and I always think maybe this is the year it will be more scary than fun, but I went on it with Noah and it was more fun than scary so that day hasn’t come yet. Beth probably knew I was going to go on it but she listened patiently while I talked myself into it. I do this every year. While we were riding the Comet, June went on the Laff Track, an indoor, glow-in-the-dark coaster that goes backward. We were finished with the park, but not with Hershey. 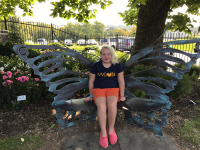 On Saturday morning, we spent a few hours in the botanical gardens on the site of Milton Hershey’s original rose garden, visiting the butterfly atrium, the rock, ornamental grasses, and herb gardens, and of course, the roses. With Beth’s help, June (who has decided to use gender-neutral pronouns) shot a short film about what they would do all day if they lived in the gardens. We had lunch at an Italian bistro in Hotel Hershey and then went back to Chocolate World for dessert and to shop for candy. June also came out of there with a doll wearing a dress with Hershey’s kisses all over it. Its name, of course, is Candy. And as tradition dictates, we rode the factory tour ride, though the kids were distressed to find they’d changed the theme song the cows sing. Finally, around mid-afternoon, we drove away from Hershey and the last of our summer getaways was over. But someday we’ll be back. And when we are, June will be a Twizzler. This entry was posted in Gender Roles and Identity, Travel by Steph. Bookmark the permalink.